WASHINGTON (Reuters) -- Police arrested a man on Friday suspected in three shootings over two days in the Washington, D.C. suburbs that killed three, wounded three and revived memories of the "Beltway sniper" attacks of 2002. Eulalio Sevilla Tordil, 62, a police officer with the U.S. Department of Homeland Security, was arrested near the shopping center where the second of Friday's two shootings took place, police said. He had been suspected of killing his wife and shooting a bystander on Thursday in Prince George's County, Maryland. When a pair of shootings broke out in neighboring Montgomery County on Friday, investigators turned their attention to Tordil, who had threatened to commit "suicide by cop," police said. 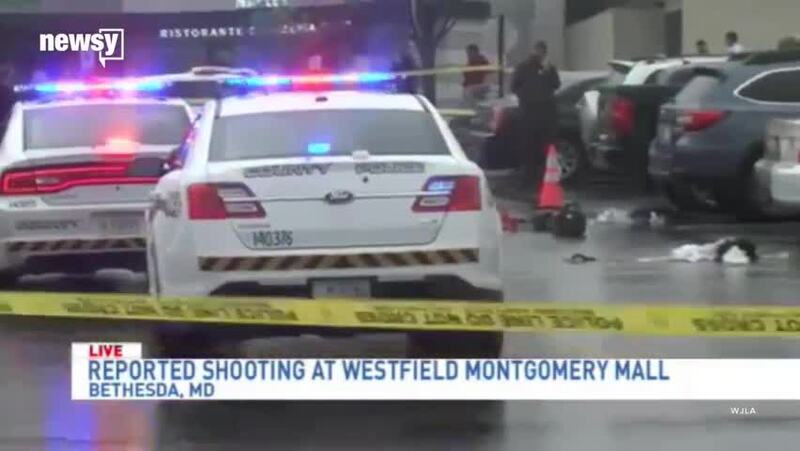 The first of Friday's incidents began with a confrontation in a parking lot at Westfield MontgomeryMall in affluent Bethesda, Maryland, where two men and a woman were shot, police said. Members of the Montgomery County police collect evidence at the scene of a shooting in the parking lot of the Westfield Montgomery Mall in Bethesda, Maryland, on May 6, 2016 in which one person was killed and two others wounded. A federal police office was taken into custody Friday after shootings in suburban Washington shopping centers that left two people dead and two others wounded. Authorities said they had taken into custody Eulalio Tordil, a 62-year-old officer in the Department of Homeland Security's Federal Protective Service, which protects US government facilities. Eulalio Sevilla Tordil, 62, is shown in this undated photo provided May, 6, 2016. Police are seeking Tordil, an officer with the U.S. Department of Homeland Security, who is suspected of killing his wife and shooting a bystander on Thursday in Beltsville, Maryland. A member of the Montgomery County police searches for evidence under a car at the scene of a shooting in the parking lot of the Westfield Montgomery Mall in Bethesda, Maryland, on May 6, 2016 in which one person was killed and two others wounded. A federal police office was taken into custody Friday after shootings in suburban Washington shopping centers that left two people dead and two others wounded. Authorities said they had taken into custody Eulalio Tordil, a 62-year-old officer in the Department of Homeland Security's Federal Protective Service, which protects US government facilities. A mobile command post of the Montgomery County police is seen at the scene of a shooting in the parking lot of the Westfield Montgomery Mall in Bethesda, Maryland, on May 6, 2016 in which one person was killed and two others wounded. A federal police office was taken into custody Friday after shootings in suburban Washington shopping centers that left two people dead and two others wounded. Authorities said they had taken into custody Eulalio Tordil, a 62-year-old officer in the Department of Homeland Security's Federal Protective Service, which protects US government facilities. Captain Paul Starks of the Montgomery County police speaks to the press at the scene of a shooting in the parking lot of the Westfield Montgomery Mall in Bethesda, Maryland, on May 6, 2016 in which one person was killed and two others wounded. A federal police officer was taken into custody Friday after shootings in suburban Washington shopping centers that left two people dead and two others wounded. Authorities said they had taken into custody Eulalio Tordil, a 62-year-old officer in the Department of Homeland Security's Federal Protective Service, which protects US government facility. A member of the Montgomery County police prepares to collect evidence at the scene of a shooting in the parking lot of the Westfield Montgomery Mall in Bethesda, Maryland, on May 6, 2016 in which one person was killed and two others wounded. A federal police office was taken into custody Friday after shootings in suburban Washington shopping centers that left two people dead and two others wounded. Authorities said they had taken into custody Eulalio Tordil, a 62-year-old officer in the Department of Homeland Security's Federal Protective Service, which protects US government facilities. Members of the Montgomery County police prepare to collect evidence at the scene of a shooting in the parking lot of the Westfield Montgomery Mall in Bethesda, Maryland, on May 6, 2016 in which one person was killed and two others wounded. A federal police office was taken into custody Friday after shootings in suburban Washington shopping centers that left two people dead and two others wounded. Authorities said they had taken into custody Eulalio Tordil, a 62-year-old officer in the Department of Homeland Security's Federal Protective Service, which protects US government facilities. Police stand by at the Aspen Hill, Md., Giant during investigations of shootings in at least three different Baltimore-area venues -- the Montgomery Mall, High Point High School, and the Aspen Hill food store -- as a suspect, 62-year-old Eulalio Tordil, is taken into custody on Friday, May 6, 2016. Investigations of shootings in at least three different Baltimore-area venues -- the Montgomery Mall, High Point High School, and this one, at the Aspen Hill, Md., Giant food store -- as a suspect, 62-year-old Eulalio Tordil, is taken into custody on Friday, May 6, 2016. Members of the Montgomery County police walk at the scene of a shooting in the parking lot of the Westfield Montgomery Mall in Bethesda, Maryland, on May 6, 2016 in which one person was killed and two others wounded. A federal police office was taken into custody Friday after shootings in suburban Washington shopping centers that left two people dead and two others wounded. Authorities said they had taken into custody Eulalio Tordil, a 62-year-old officer in the Department of Homeland Security's Federal Protective Service, which protects US government facilities. One of the men died, the other was in critical condition, and the woman's life was not considered in danger, said Assistant Chief Darryl McSwain of Montgomery County police. The second shooting took place about half an hour later, killing a woman at the Aspen Hill Shopping Center in Silver Spring, some 8 miles (13 km) away. Bethesda and Silver Spring are suburbs of Washington in Montgomery County, which neighbors Prince George's County. Tordil was an officer with Federal Protective Service and was known to carry a handgun, police said.